On Friday I took another one of those wonderful excursions with my genealogy society luxracines. I’d been looking forward to this trip for a long time. 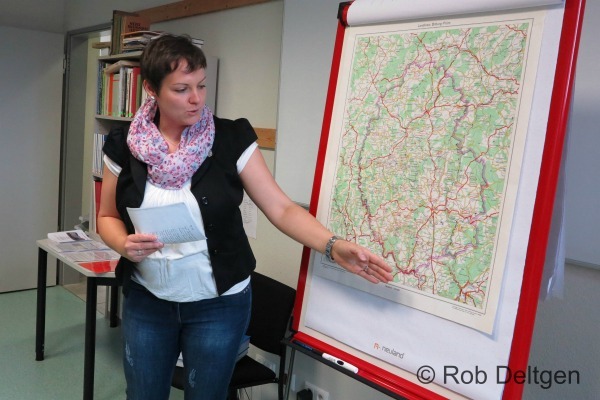 In the morning we visited the District Archive of Bitburg-Prüm or Kreisarchiv Bitburg-Prüm in the city of Bitburg where we were greeted by Tabea SKUBSKI, the district archivist. She presented the archive to us with great enthusiasm. Inaugurated on 19 April 2007 it is run full-time by Tabea SKUBSKI and her colleague Gaby THOMASER. 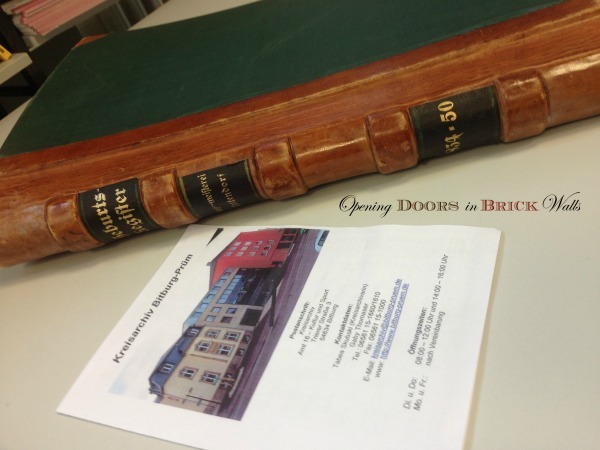 It is a joint archive for the Eifelkreis Bitburg-Prüm, the five Verbandsgemeinden (Arzfeld, Bitburger Land, Prüm, Speicher, and Südeifel), as well as the city of Bitburg. Eifelkreis Bitburg-Prüm is the district in Rhineland-Palatinate, Germany. A Verbandsgemeinde is a low-level administrative unit typically composed of a small group of villages or towns. Previously found in Koblenz, the original records of the municipalities of this district were returned to the district archive and are in very good condition. For an annual fee of 15 euros, permission is granted to take photographs of the records without flash. It is advised to use gloves and/or sanitize hands before and after handling records. Gloves and a hand sanitizer are found in the reading room where beverages and food are not allowed. The only writing utensils allowed are pencils. First-time users are required to fill out an application form for the use of the archive and another permission form for photography. Mrs. SKUBSKI explained the archival content, the geographical boundaries, opening hours, and use and handling of the records before taking us behind the scenes into the actual archival storage area where specific climatic conditions are regulated to best suit the preservation of the records. Enough time remained after the presentation to browse through the registers, reference material provided, and even to do some serious record searches. 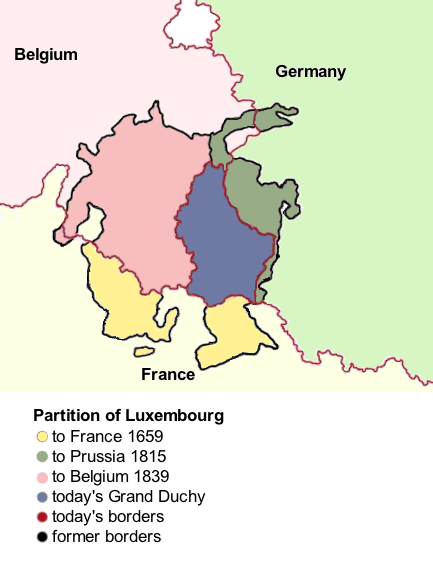 Many Luxembourgers have family roots in the Eifel as it was once part of Luxembourg. In 1815 as a compensation for damages suffered by the French this area became part of Germany (darker green area in the map below). My main interest is the civil registers of the towns in this region. They are of great importance to my family history research as my maternal grandfather came from Ernzen, Germany. The registers available to the public are available from about 1798 for births, marriages, and deaths. Due to privacy laws, the BMD records are accessible only up to a certain year: for births older than 110 years, marriages older than 80 years and deaths older than 30 years. After filling out the required forms I asked for the last Bollendorf birth register which would include the year 1906 when my maternal grandfather Nicolas WILDINGER was born in Ernzen. The village of Ernzen had their own records only until 1854 and then it was included in the registers of Bollendorf. Unfortunately, this register had already been requested by someone else in our group. However, on a closer perusal of the list of BMD registers for the Standesämter (civil registration offices) showed that Bollendorf births are only available at the archive up to 1900. Several years before the 110 years cutoff for births have not yet been deposited with the archive as they are included in a register which ends after the cutoff. I’d come well prepared and had a list of more records I wanted to access. I decided to go to the bottom of the list and check on the earliest birth record. I requested the Ernzen birth register (1799-1825) and photographed the entries for two 3rd-great-grandmothers: Elisabeth WELTER 1807 and Catarine SCHRAMEN 1812. I was a bit stumped when I couldn’t find Hubert WEIMANN’s 1805 birth in Ernzen. Either I was too excited and missed it or I have the year and/or place of birth wrong. Then I asked the archivist to pull the next Ernzen birth register (1826-1854) which is huge. Seeing my surprise she said it is one of the largest books in the archive. In it, I found my great-great-grandparents Bernard WILDINGER 1838 and Maria WEIMANN 1839. My last request was for the Mettendorf birth register which would include the years 1842-1843 and was given the 1834-1850 book (below). In it, I found the 1843 birth record of Mathias PÖPPELREUTER (as spelled in the record, later spelled PÖPPELREITER) and the 1842 birth record of his wife Magdalena WAGNER. Time flew and it was time to take a short walk to the restaurant we had reserved. 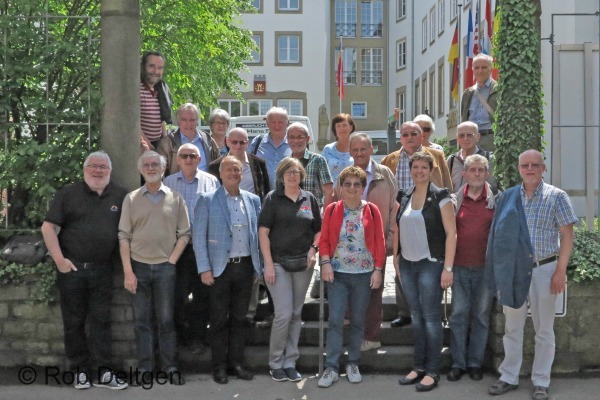 After a leisurely lunch in the heart of Bitburg, we gathered for an official group photograph. luxracines members who participated in this field trip. Following a short walk through the beautiful pedestrian zone, we continued our trip to Irrel to visit a World War II bunker. Photos by Rob Deltgen used with permission. What a wonderfully educational excursion! Thank you, Luanne. 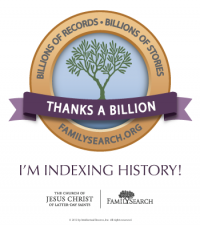 I was in genealogy heaven!! I am sure you were! I can’t even imagine how exciting this was. What a wonderful trip…thanks for sharing and I love the group shot. How fun! We always try to get a group shot when we go on these fun trips. The best part is that this archive is 20 minutes from where I live!! Thank you. What fun! I have relatives from the Rhine-Palatinate region. Perhaps someday the records from my towns (Gau-Algesheim, Gaulsheim/Bingen) will be digitized…. Hopefully, for you! Thank you, Amy. It was a fun day. The records they have in the Kreisarchiv Bitburg-Prüm have not been digitized so I am glad it is only a 20-minute drive. I’m going to have to make a list of all the records I need to look up. I hope the records you need will be digitized soon, Amy. I’m here reading your post and needless to say that I found it fantastic. It has everything to do with me and my Kapps from Ernzen! I continue here hoping for the success of your research! Congratulations! Big hug! Hello Miguel. 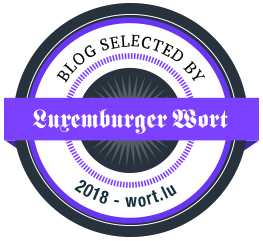 It’s wonderful to see you are still following and read my post about the Kreisarchiv Bitburg-Prüm. It is the only place for now for us to find the civil records of our ancestors from this area. All my best to you. There is! be sure that I am here always hoping for your success in your research that I like. Thank you! Hugs to you, Miguel.